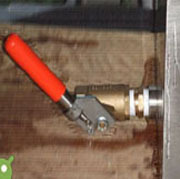 The Goslyn Grease Recovery Device (pictured below) has the stainless steel cover removed to illustrate the parts required for daily grease trap maintenance. Goslyn has no moving mechanical parts for the grease recovery process. All Goslyn models operate with the stainless steel cover in place. The stainless steel cover never needs to be removed as the unit has hinged flaps for easy access and simple operation. Never use grease trap additives such as enzymes and grease trap bacterias with a Goslyn Grease Recovery Device. These products can be thrown away as these pollutants are never required. Goslyn does not use or require consumable parts. Goslyn Grease Recovery Devices require 4 simple steps to perform daily maintenance. You don't need a mask (No Odors). You don't need tools (convenient). You don't need to change your uniform (No mess). You don't need a cheque book (no contract required). 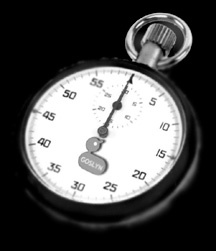 Goslyn Grease Trap Mainenance takes under 2 minutes daily. We have timed it at 1 minute and 17 seconds. Yes, this is 1 minute and 17 seconds daily. 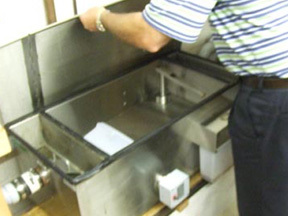 Grease Trap Maintenance must be performed daily on any Goslyn Grease Recovery Device to guarantee smooth and flawless operation. Effluent or dishwater enters the Goslyn Grease Recovery Device. Food particles are collected in the food solids strainer basket. 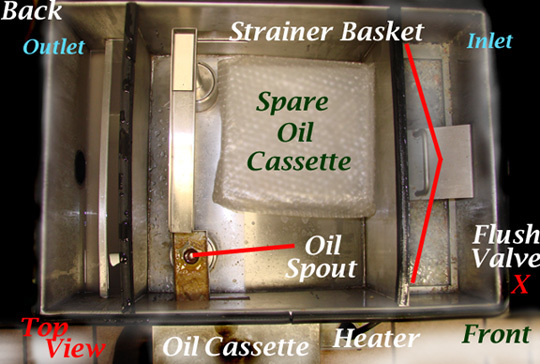 The discharged fats, oils, and grease (FOG) are collected in the FOG cassette connected at the front of the Goslyn. The recovered grease is always visible. Waste Vegetable Oil (WVO) Bins are located out back of every restaurant that utilize deep-fryers. This grease (yellow grease) is recyclable for future biodiesel use. Hydrostatic pressure (water pressure) forces the FOG up the oil valve and into the FOG cassette. The "bottlebrush" is conveniently stored just beneath the oil spout door flap. 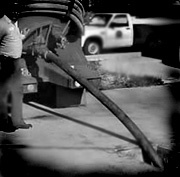 Bottlebrush is inserted into oil spout assembly to assure passage does not clog with solidifying grease. Scrape off excess grease off oil spout slope with bottle brush. Any Goslyn Grease Recovery Device can be maintained wearing a dress or tuxedo but not required. 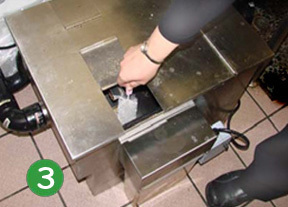 Grease Trap maintenance is easy and clean with a Goslyn GRD. Food particles and organics greater than 1/16th of a inch will never create blockages downstream from your sinks. This is another Goslyn Innovative design feature. An internal flow control is situated at the effluent inlet. An external flow control is located at the inlet chamber. The inlet pipe is always nearest the side with the strainer basket. The Spare Oil Cassette is to be removed from inside the Goslyn and stored in a safe place for future use. The Goslyn is plugged into a Standard GFI 3 Prong Plug - 110 Volt wall socket. The Heating Element works on demand via a thermostat set at 40 Celsius or 104 Fahrenheit and will only come on when the ambient temperature (surrounding temperature) of the Goslyn cools below 104F. Kitchens are always indoors and typically the warmest section of the facility. The heat assures that the fats, oil, and grease are in liquid form providing easy flow of passage out of the oil spout and into the oil cassette. The heating element requires minimal power. It draws only 9 amps. 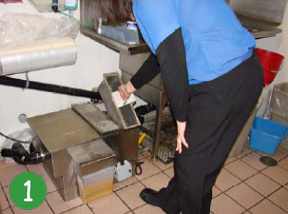 Working in a kitchen without grease mess and odor is a benefit to all restaurant staff. Maintain the Goslyn on a daily basis and the grease hassles will disappear forever while saving your restaurant time and money. What are Your Facility Operations Concerns? Time, Money, Mess, Odors, & Sanitary Conditions?